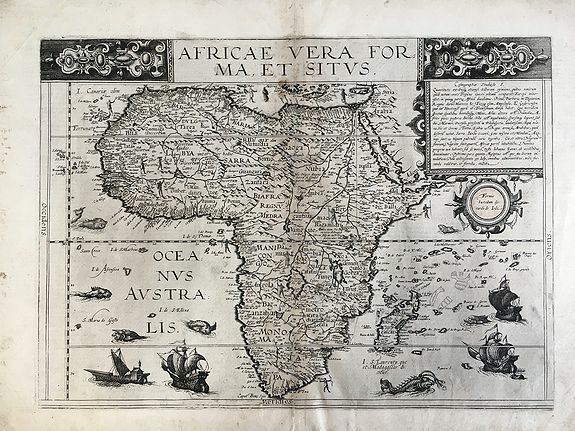 Old map by De JODE -Africae vera forma, et situs. Title: Africae vera forma, et situs. Size: 14.2 x 16.7 inches. Condition: In good condition with some small repairs and reinforcements to the lower verso. A very rare map that is an interesting amalgamation of cartographical sources. Cornelis prepared this map for the second edition of the 'Speculum' after his father's death in 1591. It replaced the African map of the first edition that had been attributed to Gastaldi. The map retains the continental outline from Gastaldi, with the interior based primarily on Mercator's world map of 1569. This is evident in the river systems, including Sachaf lac as the source of the Zabere (Zembere), Cuama and R. d S. Spirito rivers in southern Africa. 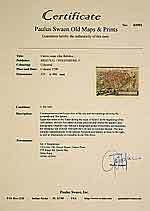 Ortelius is also a source: the placement of Zanzibar on the southwest coast. Decorated with ships and sea monsters and representations of the native people scattered across the map.